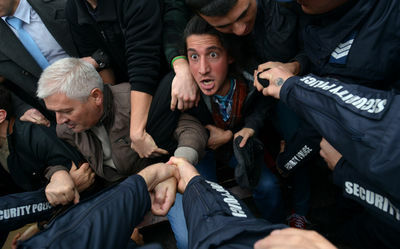 Protesters scuffle with police during a demonstration near the parliament in central Sofia November 12, 2013. Several hundred students and anti-government protesters surrounded the parliament in the Bulgarian capital on Tuesday demanding the resignation of the Socialist-led government. Riots in Bulgaria(4 of 10). Protesters and police scuffle during a demonstration near the parliament in central Sofia November 12, 2013. Several hundred students and anti-government protesters surrounded the parliament in the Bulgarian capital on Tuesday demanding the resignation of the Socialist-led government. Riots in Bulgaria(9 of 10). 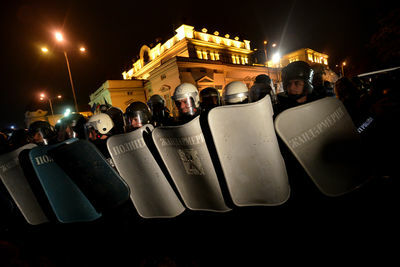 Riots in Bulgaria(10 of 10).